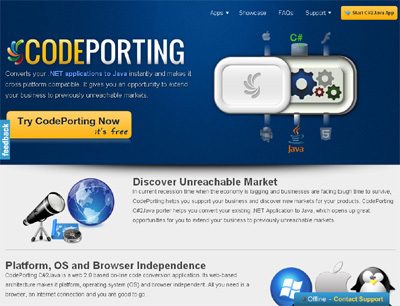 CodePorting helps you make your .NET applications cross platform compatible and allows migrating your .NET solutions, projects and files into Java in the cloud. Other than speed and accuracy of conversion; port your C# code directly either by uploading .cs files contained in a .zip file or import directly from popular version control repositories like GIT, Mercurial HG and SubVersion. You can also download a Microsoft Visual Studio plugin and convert C# code in the real time without leaving the development environment. You may also build your own customized code conversion applications using CodePorting APIs. CodePorting C#2Java is unique because developers can convert all of their C# (.cs files) projects and applications exactly into Java and in the cloud. You do not need to install or download any software for that. The speed and accuracy of conversion is unmatched and users can easily convert their .NET code directly from local environment and favorite IDE using the API.